Below is arguably the most comprehensive article to date on the Backgammon World Championships. I would like to acknowledge to date the efforts of Chris Bray, Carol Joy Cole, Bill Davis and Hardy Hübener in assisting to make this research more complete than it otherwise would be. In time, I'm hoping that the number of gaps remaining will be minimal. Prince Alexis Alexeevich 'Oby' Obolensky (b. 1914, St. Petersburg, Russia; d. February 8, 1986, New York, USA) was an aristocratic socialite whose family fled from Russia to Istanbul after the Revolution of 1917. Obolensky, sometimes referred to as the "father of modern backgammon", was taught the game as a child by the family's gardener. Years later, Obolensky emigrated from Turkey to the United States and travelled the world promoting the game, co-founding the World Backgammon Club and becoming its president, while Joseph Pasternack became Chief Operating Officer. Obolensky organised the first of a series of international backgammon tournaments in March 1964 when a friend of his opened the Lucayan Beach Hotel in Freeport, Bahamas (a city on the island of Grand Bahama, located approximately 160 km east-northeast of Fort Lauderdale), offering him $10,000 to gather a jet-set backgammon crowd and to fly them down for the hotel's opening. An invitational field of 32 (or 40?) players were in attendance and the Obolensky Cup was presented to Charles Wacker III of Chicago when he defeated Porter Ijams of New York in the final. In the following years, similar events were staged in the USA, Britain and other European countries. The World Championships held in Las Vegas are considered to be unofficial, although the winners are generally accepted to be World Champion. 1967: Obolensky founded The World Backgammon Club as a vehicle to promote backgammon to a new generation of players, and staged the first tournament with the title 'World Championship' in Las Vegas. The event was held in February (?) at the Sands Hotel and Tim Holland of the United States became the first backgammon World Champion. 1969: Some reports that the event did not take place (reasons unknown), other reports that it was indeed held and Alice Topping won. 1970: Appears to be universally accepted that the event did not take place (reasons unknown). 1972: Obolensky founds the Backgammon Association of America which created a standardized set of rules and organized national tournaments. 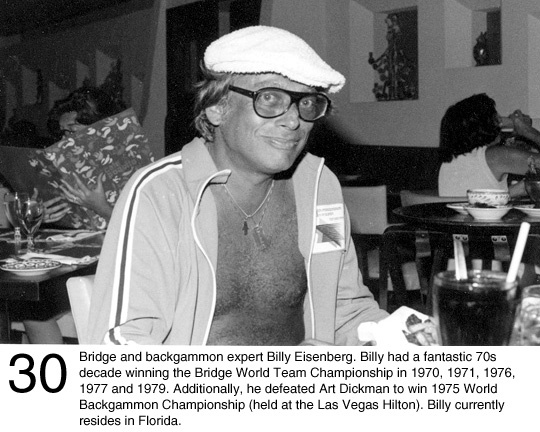 1975: While there are some reports that the event was held in the Bahamas, the July issue of Backgammon News reports that the event was held in Las Vegas, was recognised as the 7th World Championship, with the winner receiving the Wacker Cup, which was donated by Chicago's Charles Wacker III (winner of the inaugural International Tournament in the Bahamas, 1964). Winners of the European Championships held in Monte Carlo are generally considered to be unofficial World Champions. 1976–78: The Monte Carlo event is actually called the "European Championships." 1976: Lewis Deyong, a London businessman, schedules the first official World Championship to be held in the Bahamas in February at Paradise Island. 1979: Lewis Deyong combines the Monte Carlo 'European Championship' and the Bahamas 'World Championship', creating a single event in Monte Carlo. 1995: The last time the Backgammon World Championship (280) attracts more players than the World Series of Poker (273). 2003: Internet qualifier Chris Moneymaker wins the World Series of Poker, and the popularity of poker booms exponentially. 2005: The World Series of Poker moves from Binion's Casino in April/May to Harrah's Rio in June/July, thus conflicting with the World Championships of Backgammon. 2007: Over 100 of the world's best players converge upon Paradise Island, Bahamas in January for the inaugural $10,000 buy-in PartyGammon Million event, the brain-child of Michael Strato, Stephen Pearson, and Susana Major. In the final, Andreas Märtens of Germany defeated Lasse Madsen of Denmark at double match point, 23–22, to take home the winner's cheque of $600,400, Lasse collecting $144,096 as runner-up. 2008: The second PartyGammon Million event, planned as a Mediterranean cruise from Venice, Italy, is cancelled. As of 2007, the entry fee for the World Championships is €1,000, the registration fee is €235, while the prize money was €78,480, €26,160 and €13,080 respectively for the winner, runner-up and semi-finalists. Tournament entry is strictly by invitation only, and the minimum age requirement is 21. While there are many gaps in the results tables above, there are a few pieces of conflicting information. For example, was an event held in 1969, and was it won by the American Alice Topping? Some sources report this, yet other evidence indicates that no event was held at all. The July 1975 issue of Backgammon News reports that that year's event was recognised as the 7th World Championship, and working back, that would support the fact that no event was held in 1969 or 1970. That same report lists the 1975 Championship as being held in Las Vegas (as does this photo taken by the late Michael "Max" Maxakuli), while other sources report the event being held in the Bahamas. [Author unknown]. "The Money Game". TIME Inc 19 February 1973. Retrieved 7 November 2007. [Author unknown]. "Winners of Major Backgammon Tournaments". Gammoned. Retrieved 7 November 2007. Bower, Chuck. "History Of Backgammon". GammOnLine August 1999. Retrieved 7 November 2007. Crane, Michael. "World Championships 2000". MindZine - Backgammon 25 July 2000. Retrieved 7 November 2007. Deyong, Lewis. "A Goombay Smash". International Backgammon News May/June 1977: 1-4. Deyong, Lewis. "Early Days Of Backgammon". Ladbrokes Backgammon. Retrieved 7 November 2007. Driver, Mark. "A History Of Backgammon". GammOnLine November 2000. Retrieved 7 November 2007. Driver, Mark. "Monte Carlo Or Bust". Gammon Village 25 June 2002. Retrieved 7 November 2007. Driver, Mark. "The Backgammon Chronicles". Gammon Village 5 April 2002. Retrieved 7 November 2007. GammonLife. "32nd World Backgammon Championships". Retrieved 7 November 2007. Gammon Village. "Tournament Detail - 2001 World Championship". Retrieved 7 November 2007. Gammon Village. "Tournament Detail - 2002 World Championship". Retrieved 7 November 2007. Gammon Village. "Tournament Detail - 2003 World Championship". Retrieved 7 November 2007. Gammon Village. "Tournament Detail - 2005 World Backgammon Championship". Retrieved 7 November 2007. Gammon Village. "Tournament Detail - 2007 World Backgammon Championship". Retrieved 7 November 2007. Heckert, K. "Historie - Weltmeisterschaften Backgammon". Sport Komplett. Retrieved 7 November 2007. MindZine - Backgammon. "2000 World Championship Full Results". Retrieved 7 November 2007. Pasternack, Joe. "The Father Of Modern Backgammon". Gammon Village 20 September 2001. Retrieved 7 November 2007. Reade, Martin and Michael Strato. "World Championship Results History". Gammon Village 7 November 2003. Retrieved 7 November 2007. Robertie. Bill. "Adventures In Monte Carlo". Gammon Village 1 August 2002. Retrieved 7 November 2007.